Cookbook authors have routines they follow to help them focus and write their manuscripts. Let’s take a look at the role of music in the manuscript development of some award-winning cookbook authors. What’s it like to write a fully illustrated and handwritten cookbook in this day and age of food photography? Kathryn Taylor from food blog Cookie + Kate shares her tips on writing a cookbook in advance of publication of her book Love Real Food. Here’s another blog post from Kathryn in 2015 when her cookbook project was starting and she was in the process of testing and developing recipes. If you’ve ever considered self-publishing your cookbook, this article sheds light on both traditional and self-publishing with some $$$ attached. Why Your Memoir Won’t Sell by Jane Friedman. I like almost all the advice Jane gives and this provides so great tips for those who want to write a memoir. Roundtable discussion about writing memoirs with five literary agents. Jane refers to this article in her blog post, and even though it was from 2010 it’s full of great information. Imagine if you knew five questions that every editor, publisher, marketer, reviewer, and reader of your book would love to know your answers to. Imagine that if you took the time to answer these questions before you write your book, how much more on target the finished proposal and book would be. Imagine answers to such questions that could direct and inform the book entire project. Answer the questions below and you’ll have a crystal-clear focus. In addition, you will be able to supply essential information for your publisher, marketing team, book reviewers, and most importantly the buyer of your book. 1. Am I willing to control my thoughts, manage my time, and commit to activities to imagine, write, publish, and sell this book? Answer this question first for yourself in an honest and real way. Can you commit to the work and dedication to propose, write, publish, and market your cookbook? Is your mindset a growth mindset (I can do this) or a fixed mindset (It’s too hard and I’m confused)? If the answer is a yes, move onto the following questions. If you’re wavering, get your thoughts and commitment in order before you proceed. This may seem obvious, but it’s important to be able to succinctly describe your book’s topic as well as how you identified the topic to write about or how you became interested in the topic. Include the book’s argument or problem that you are solving. If there is a payoff to this book, meaning if you read this, or cook this, you’ll get that, then describe the payoff. Describe what is new about this problem or argument in your book. Include what stopped you “cold” and made you want to write a book about this topic. If this topic is popular or written about in previous books include what you are adding to the idea or topic through the book. 3. Why are you the person to write this book on this topic? Sell yourself as the author. Describe your expertise, social proof, and/or proven messages you have in writing, speaking, or teaching about this topic. Brag about the overwhelmingly positive responses you received to the message. Describe what you bring to the topic. Everyone from editor or marketer wants and needs to know why you are the perfect author for this book. 4. Why is now the time to publish the book? Everyone is writing books. Publishers need books to publish. Describe why this is the perfect time for this book. Even with existing books (which you will describe in the competition section of a proposal) why there room for another book on the topic in the market. 5. Who makes up the core audience for the proposed book? If you’ve followed me here for a while, then you maybe know by now that I live by my routines. I don’t die by them, meaning I try not to get too hung-up if something doesn’t go as planned, but the routines I have in place free me from worry that I’ve forgotten to do something and free me from pressure to do things at the last minute. With a good routine and a weekly plan I’m able to accomplish my goals related to business, writing, family, hobbies, and social time. In this blog, Scott Myers discusses the process of writing and writing routines with various writers. I love to read about other’s routines, and I hope you enjoy this too. When it comes to food terms, we often wonder about editorial style, italics, spelling, hyphens, and other seemingly fussy details. Every year the AP Stylebook (AP stands for Associated Press which is an association of newspapers, radio and TV stations.) 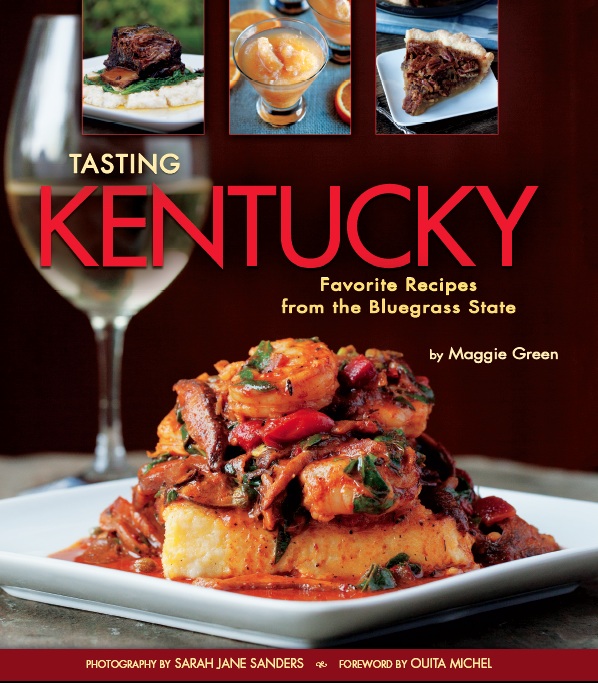 includes food entries and adds new food entries that are making their way into mainstream media. The stylebook dictates how journalists, writers, and broadcasters are to “style” the terms presented in the book. Here’s the link to an Eater article about the 2017 AP Stylebook as well as a link to the various options for buying the style book. I do like this list for two reasons: it shows me what food terms are becoming mainstream and how the AP likes to spell the terms. When we write our cookbooks, we pick our style, but it’s interesting to me to see the preferred spelling and style from the AP. On these sites you’ll find information about traditional and self-publishing, book marketing, writing, freelance opportunities, agents, copyrights, contracts, and author rights. Offers updates about all things related to publishing. A well-known site for up-to-date information about the publishing industry. Also, available is a daily called Publishers Lunch for a subscription fee that summarizes book deals, changes in staff publishing houses, and acquisitions and mergers within the publishing industry. Geared toward writers who are interested in writing eBooks with their various routes to publishing, as well as internet marketing and promotion for books. Editor Mary Jaksch shares what she and guest bloggers have learned about writing better. This blog is for any writer looking to improve their craft and their art. WOW offers on-line writing classes and search functions for publication routes and agents. Sign-up for their e-Zine promoting the communication between women writers, their editors, their agents, and more. An excellent on-line resource for writers that offers blog posts, resources, and articles all about writing. One of my private coaching clients is discerning the format of the food/cooking book she wants to write. Part of her wants to write a memoir and part of her a cookbook. One would be more story driven, and the other more recipe driven. She was then questioning whether she needed to write a book proposal for a memoir and wanted me to tell her what to do. As a coach, I try to avoid giving direct responses to my clients that can be perceived as telling them what to do. Not giving a direct response is a challenge because that’s often what my coaching clients desire – someone to validate their next step. As a coach, I want to facilitate their decision-making process, and let them create their own results. But, in this instance, I wanted an informed answer, from someone in the trenches, about writing a book proposal for her book concept. Editor #1: She needs to write a proposal but does not need to write a full manuscript. Editor #2: I would advise the author to put together a proposal if possible. It is a wonderful and helpful exercise and ultimately will be a strong snapshot for a publisher or agent to gather information quickly about the project. It is important to include marketing thoughts and comparable books as well. Editor #4: A proposal is a way to go. That’s what literary agents and editors/publishers are going to want to see: an outline, sample chapter, author bio, competitive/comparative title overview, marketing strategy. Writing a cookbook should not be a mysterious process. Also, writing a cookbook is not a project available only to celebrities and TV stars. If you have a passion about baking, nutrition, special diets, or cooking, and you have an audience who needs something you know about, then you can write a cookbook. Based on my experience with both my own and other author’s cookbook projects I’d like to dispel a few myths about writing a cookbook. 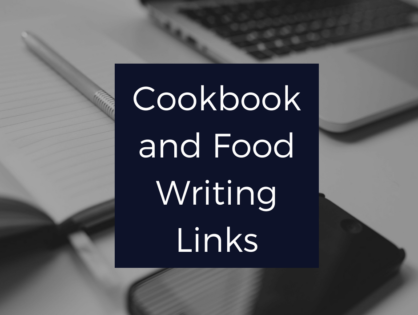 While a food blog might help with promotion of a cookbook or it may provide the way that you connect with your audience, you do not have to have one prior to writing a cookbook. I have written two cookbooks, and am under contract for two more books, and I don’t have a food blog. I tried to start a food blog once, but it did not take long before I realized that I didn’t enjoy food photography. Also, I am interested more in cooking and building my business than I am in taking the time to learn how to photograph food. There are other cookbook authors who do not have a food blog. However, even if you don’t have a food blog, what you do need is a platform. This is how you connect with your audience and how your audience connects with you. If you are a consultant, speaker, cooking or baking teacher, food or nutrition writer, you have a connection with an audience even without a food blog. Agents and publishers like robust platforms, but this is not always specifically a food blog. I cannot write a book because someone has already written about my topic. Let’s put this myth to rest. Take a trip to a local bookstore or the Food, Cooking, and Wine section of cookbooks on Amazon.com and look at how many Italian cookbooks or cookie books or Paleo diet books are published and in print. Even if your topic has been written about before, there is room for you and your unique spin on the subject. That is the difference between your book and everyone else’s book – YOU! -and your unique approach to the topic. Insert yourself in any topic you write about and provide for your audience what they want and need in a way only you can. No one has written that book before. I must have my cookbook published by a major publisher. This roundup, while not specific to cookbooks and food writing, contains websites and organizations for writers of all genres. On these sites you’ll find information about traditional and self-publishing, book marketing, writing, freelance opportunities, agents, copyrights, contracts, and author rights. Join the premium membership level AvantGuild at Media Bistro to enhance freelance writing work. For a membership fee you receive access on how to pitch articles, access to health insurance for freelancers, and discounts on classes, Freelance Marketplace, and more. Recognized by Writer’s Digest as one of the best websites for writers, this website provides a genre-specific searchable database of literary agents. It was just a few months ago that I negotiated my third and fourth cookbook contracts. I’ve actually negotiatled all of my cookbook contracts because I don’t have an agent. I toyed around with getting an agent, mainly to see if I could get a better advance, but because I was approached by a publisher, I decided to move forward and negotiate my own terms again. I’m really not sure if this is unusual, but I’ve done it now for the third time, and thought I’d share a few things I learned along the way. Note: This information is NOT professional legal advice because I am not an attorney or an agent. So, if you’re unsure about the way this relates to your specific cookbook contract situation then I highly advise you to seek professional legal advice. This is not legal advice. Use it for information, but seek an attorney if you need one. Think of negotiating your cookbook contract like negotiating the purchase of a home. Sometimes you use a real-estate agent and sometimes the house is For Sale By Owner. In either case, each party is expected to negotiate. In book deals, not every author has the same contract outcome and in home buying the same is true. But, in all cases it’s all about negotiation and a back-and-forth discussion. In the end what you hope for is a deal where each party feels good about the outcome of the contract. Then the project can move forward in a positive fashion. *cookbooks for diet/health: Skinnytaste Fast and Slow. Heidi Swanson of 101 Cookbooks got her start blogging about what she cooked from her collection of cookbooks. She added photography and her goal was that she “would learn a lot and gradually improve my writing, cooking, and photography; it would be a personal, creative outlet.” Read more about How Heidi Swanson made 101 Cookbooks. Bowls are the new plate? Lots of bowl cookbooks being written. We are obsessed with food. In Australia, four of the five bestselling books related to food and nutrition. This in an interesting article, from Huff Post Australia that claims Cookbooks Aren’t Going To Solve Our Health Problems. Lucky Peach’s list of cookbooks you need when you must create an “impressive feast”. If you’re anything like me, you write lists, maintain ongoing lists, and refer to lists that pertain to both business and personal life. Examples of lists I write or refer to regularly include shopping, errands, phone calls, grocery, gratitude, tasks to complete, recipes to test, recipes to develop, people/situations to pray for, goals, projects, bills to pay, passwords, and birthdays. In the management of these lists, I vacillate between lists maintained in my daily planner (handwritten), a notebook (handwritten), as well as Scrivener, Drafts, Dashlane, WorkFlowy, and Excel (electronic). So far, my mixed system of handwritten lists and electronically maintained lists works for me. I measure my success with the ability to find what I need when I need it, and the ability to access the list in a cross-platform way, especially with the electronic lists. Despite these systems functioning well, I always tend to go back to handwritten for certain tasks or when I need to make a brain dump and sort and organize the things I have on my mind. This is an interesting article about how hand-writing to-do lists helps your brain, and who does’t need a boost in brain power? If you want to write a cookbook, I guarantee that obstacles will appear the minute you state your intention. Obstacles block your path and hinder your progress. Sometimes, you’ll hear an obstacle called a barrier, stumbling block, hurdle, or snag. No matter what it’s called, it can stop you dead in your tracks. Sometimes you jump over obstacles. Sometimes they make you retreat and give up on your project. The sad thing is that most of the time, even when we give up, we had the opportunity to overcome the obstacles – but we chose the easier path. Let’s take a look at what obstacles are, which obstacles we can control, and some tips on how to overcome obstacles when they appear. Obstacles can be material or non-material, real or imagined. 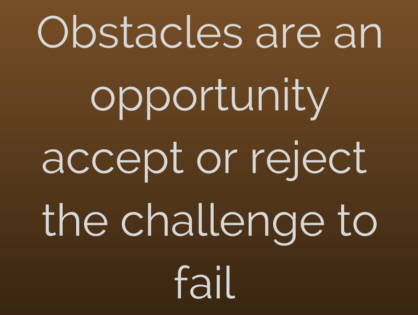 For example, a blood clot, concrete barrier, or wall are real obstacles. We can physically touch or see them. They block the flow of blood, traffic, and people. It’s possible to physically remove these obstacles and allow the flow of blood, traffic, or people to continue again. With a cookbook writing project, though, barriers are frequently non-material or imagined barriers. We can’t see or touch them. But, they still block our path to our goal. In my time as a cookbook coach, I’ve heard clients describe their obstacles to writing a cookbook. I’m too busy. I don’t work fast enough. I’m not creative. I’m too old. I can’t think of what to write. I work during the day. I have kids. I travel too much. I’m confused. I’m overwhelmed. The economy is bad. People might not like my book. It’s summer, and I want to go to the pool. I can’t define my cookbook concept. Any number of barriers have come up. Some of my clients gave up because of the obstacles. The good news is that we can control many of these obstacles. Our emotions, judgments, attitudes, perspectives, desires, decisions, determination, and thoughts are ALL within our control. We can alter the effect these obstacles have on our projects if we learn how to go around them and move our book projects forward. Then, there are obstacles we can’t control: the economy, life circumstances, other people’s behavior and judgments, or disasters. But, even if these out-of-our-control obstacles have a real effect on the world, we do have control over how we think about them. We don’t have to let our thoughts about the economy, other people, or disasters define what we do.We can decide to proceed in spite of these obstacles. Even though we can’t control them, we can control ourselves. One of my favorite resources for food trends is Allecipes’ Measuring Cup Consumer Trend Report. This report provides information from the Allrecipes group of home cooks such as how they shop, cook, and eat. Using intense databases and online information gathering, Allrecipes has the unique ability to gather information related to the online activity of their users. Here’s a link to their September 2016 report on Back to Kitchen trends. Also, don’t forget to follow my Food Trends Pinterest board and watch FPS for my annual Food Trends roundup in January 2017. I hope you enjoyed last week’s Fall Cookbook Roundup. If you missed it, you could read the blog post here. Last week I signed two new cookbook contracts, so I’m getting ready to write cookbook #3 and #4! I love new projects, and the process of writing a cookbook is one of my strengths. I think I’ve mentioned this before, but for me, it’s easier for me to put together a cookbook manuscript than it is to maintain a food blog. The advantage of a cookbook project is that I get to do what I’m good at (develop, write, and test recipes) and let others help me with the rest (such as photography, design, and production). In addition, a cookbook project is finite, and there is a financial reward. I feel the excitement to get started on the research for the cookbooks. With the signing of the contracts fresh in my mind, I thought I’d share a blog post and tool that relate to contracts and manuscripts. 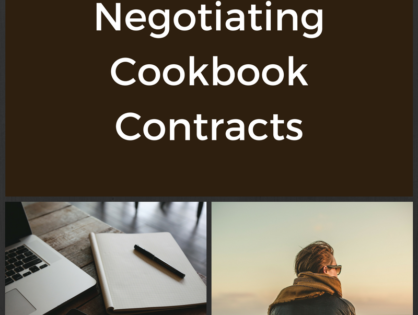 First, here is a blog post with 6 Tips to Negotiate a Traditional Cookbook Contract. This blog post is NOT professional legal advice because I am not an attorney or an agent. So, if you’re unsure about the way this relates to your specific situation, then I advise you to seek professional legal advice. Just like my last cookbook, I plan to use Scrivener as a tool to write the manuscripts. My favorite feature is the way the data is managed in smaller files until it’s compiled, along with the addition of metadata to sort the work I need to do. Here’s a nice video on the basics of Scrivener in case it might be of interest to you when you write a manuscript. My 2nd cookbook, Tasting Kentucky: Favorite Recipes from the Bluegrass State continues to keep me busy. Most marketing efforts for this book are up to me. Every week I schedule time to contact new sales and signing leads and to follow-up on activities from the previous weeks. One of my go-to resources for topics related to writing, publishing, and marketing is Joanna Penn, of The Creative Penn. You can read here her thoughts on marketing or if you’re interested buy her book, How to Market a Book where she discusses marketing principles, prerequisites for success, short-term marketing concepts, author platforms,and book launches. November is #NaNoWriMo (National Novel Writing Month). While this newsletter is about writing cookbooks, there are similarities between writing novels and cookbooks. As part of a #NaNoWriMo promotion, I became aware of this complimentary copy of The Ultimate Guide to Writing Advice. It takes time to build an author platform. It also takes time to write a cookbook proposal or manuscript. In this blog post, Chad R. Allen answers the question How Do I Write My Book and Build a Platform at the Same Time? If you have questions about what an author platform is and how to build one, read my blog post and download the Build Your Author Platform worksheet. Follow my Food Trends board on Pinterest. This is the place where aspiring authors get antsy to write their cookbook manuscript. The good news is that the entire book manuscript isn’t necessary at this point. What you need to focus on next is writing a cookbook proposal. What is a cookbook proposal? A cookbook proposal is a business plan for your cookbook. In a proposal, you summarize your cookbook concept and sell yourself as the author of the cookbook. You may be lucky enough to have a publisher approach you about writing your cookbook, you may choose to self-publish your cookbook, or you may send your proposal to agents and/or a publishing house, but in any case, it’s recommended to focus now on writing a proposal. How long it takes to write a proposal depends on your motivation, your platform development, and how many recipes you have ready to include. 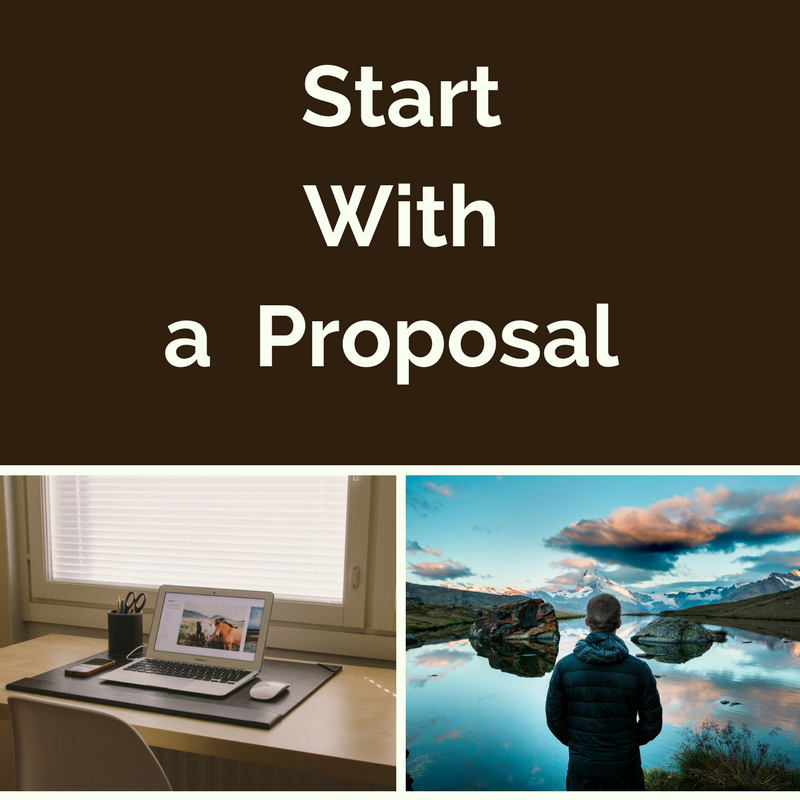 I’ve seen aspiring author focus and write a proposal in 90 days, but a lot will depend on your ability to concentrate and prioritize the work to write the proposal. 1. A plan that organizes your concept, competition, content, audience, and marketing/promotion ideas. 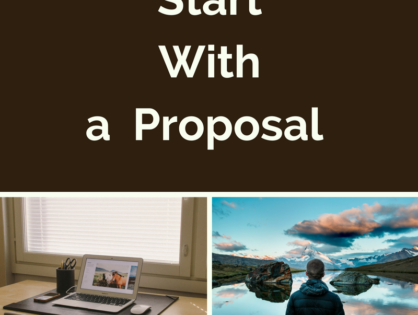 A proposal communicates in detail your vision for your cookbook. When shared with agents and editors you can find out if they are willing to invest time and money on the publication of your idea. It is possible to query an agent, and some editors, by only sharing your cookbook concept, but be prepared for them to request a proposal if they want to see more. In some cases, agents like to only see a cookbook summary submitted and then they help shape the proposal before submission to a publisher. 2. A snapshot of your writing style and voice, as well as a taste of your cookbook through a sample of your best recipes. 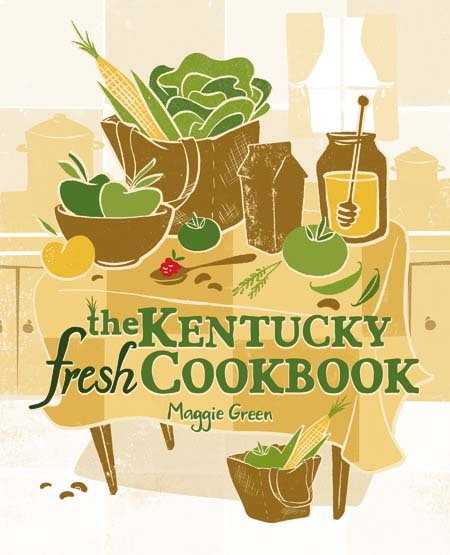 Well written text and delicious recipes make a strong case for you as the author of this book. If you can write a proposal, chances are you can write a cookbook. 3. A litmus test for your commitment to writing a cookbook. Any aspiring author who can follow-through on writing a proposal shows commitment to their cookbook project. 4. A tool that forces you to think not only about your book but what you bring to the table for marketing and sales of the book. Here you define your platform and how it can help sell the book. idea. You need to research competing cookbooks to show how your book will fit into the current publishing landscape. The purpose of studying competitive books is to generate list of cookbooks that are similar in their audience, concept, and category to the book you want to write. This list is then shared with potential agents and editors so they can visualize where your book fits in the context of other published cookbooks. It’s important to realize that the goal of the research isn’t to prove that your concept is unique and that you don’t have any competition. In fact, the opposite is true. You want to point out your competition to validate your idea and then add why it’s time for you to write a similar book for this audience and what you plan to add to the conversation regarding your perceived cookbook concept. The study of published cookbooks can be a source of inspiration as well. While looking at other cookbooks pay attention to what delights you – cover design, paper, fonts, interior colors, photography, recipe or text layout, trim size, or other features. Parts of other books that attract (or repel) you are clues about the type of book you may want to write. 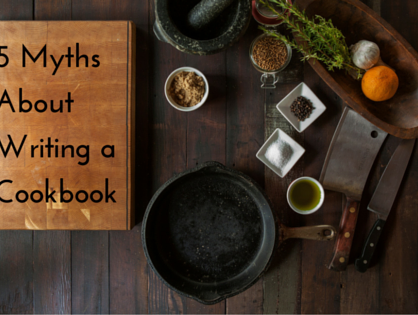 Don’t let the study of other cookbooks deter you from writing your cookbook. Sometimes it feels overwhelming to see so many cookbooks already published. When we see these books we may feel doubt that we can see a cookbook project through to publication. The best remedy for this feeling is to acknowledge that there are hundreds of cookbooks published each year, but the exact book you want to write hasn’t been written yet because you haven’t written it. Your message can only be communicated in a way that you can write it. Use the study of published cookbooks to motivate you and not deter you. Work hard and commit to move forward with your project. I emailed four acquisitions editors to ask about obtaining sales figures for published cookbooks. They all acknowledged that sales data is hard to obtain outside of Nielsen BookScan. As a result, they don’t expect to see exact sales figures, but Amazon and other research can give clues about the popularity of a cookbook. Cookbook projects are multi-step processes. Each project has a unique set of nuances and challenges. My goal for this blog post is to acknowledge the challenges and help you evaluate your commitment to seeing the project through to completion. Commitment to your cookbook project is an essential ingredient for successful completion of all phases of the book – your book proposal, manuscript, and ultimate publication and book promotion. In the end, your willingness to commit to these all phases defines the success of your book. Below are several steps that can help you to commit and take action on your cookbook project. Determine your path in the publishing landscape. As I discussed in a recent blog post on routes to publication, there are various options for publishing your cookbook. If you are not clear on your route to publication I encourage you to stop and take time to make this decision. Once you decide on your path, take time to learn and follow that path. Committment to your options on the path will help you ignore the shiny parts of other choices. Dream big, but work small with patience. It’s ok to keep your end goal in mind and imagine how it will feel to share a copy of your book with your audience, family, or friends. But, once you imagine the excitement, thrill, or exhilaration, you have to be patient with the process. This is when it’s important to return to your next step in the process and do the work of the next stage well. With patience and deliberate actions, your cookbook will get written and published as you desire. Enhance focus and concentration. Focus and concentration are harder than ever in our virtual- and social-media driven lives. I receive numerous texts, phone calls, emails, Twitter notifications, and package deliveries in the course of my typical work day. The outside world wants in even when I have the need to focus or concentrate. It’s up to me to commit to creating time and a place where I can focus and concentrate. In part 4 we are going to talk about your author platform as a key part of writing your cookbook. Your author platform serves to help your audience get to known you better. It’s how they see you, hear you, and get to trust you. One reason to define your audience early in the process of writing a cookbook is to help you determine if building a platform is necessary. For example, if your audience is your family or college-aged kids, a platform isn’t essential. But, if your audience is middle-aged professional women who suffer from heartburn, then your platform is essential. You need to have a way to get in touch with these women, and they need to be able to find you, hear you, and see you as an expert in the treatment of heartburn through food and/or nutrition. Your platform forms the foundation of most of the promotional work you will do for your brand, business, and cookbook. Through the various parts of your platform, you are able to stay in touch with your audience and build a relationship with those who are interested in what you have to say. Every aspiring cookbook author, including those who want to self-publish their cookbook, needs to have a way to connect with their audience. In addition, if you desire to have your cookbook published with the help of an agent and/or traditional publisher know that they will find you as a potential author more attractive if they know you have a platform. Below are some specific ideas for you to consider as you build or expand your platform. The first five tasks I would consider to be of the highest priority for an aspiring cookbook author. I also recommend that you consider building the first four tasks before querying an agent/and or editor with your cookbook concept. Tasks five and six provide additional ideas for how to let your audience get to know you better. It’s not essential to do everything on this list. You can reach your goals as a cookbook author with only a few of these in place. What’s important is to do something, and to be consistent. Your audience does want to, and they need to, hear from you. As a result, they will get to know you better, and hopefully like you and trust you all because of the work you’ve put in to building your author platform. Take some time to link to the blog posts, download the worksheets, and identify your who, why, what, and how before we move to step #4. Dark and moody describes the style of many images used in cookbooks, on food blogs, and in Instagram posts. Want to photograph dark and moody? Whether you’re writing a blog post, newsletter, poem, or book, it takes courage to share what you write with others because they decide if they like what you write or not. Many fear this judgement and never write the blog posts, newsletter, poems, or books their audience needs to read. If you struggle with writing because you fear vulnerability, you may enjoy this article from Purpose Fairy that takes a look at courage and vulnerability. In part #1 of this blog series we focused on WHY you want to write a cookbook as well as your WHO – your target audience. In this part #3 of this ongoing series Steps to Write A Cookbook we will identify your HOW. These examples are all ways to get a cookbook published. The method of publication you select may be different than another cookbook author. Rather than comparison with what others are doing, I recommend you focus your energy on your reasons why you want to write a cookbook and then choose the route to publication that best matches your goals. NOTE: If you plan to sell cookbooks to the general public it’s important to build an author platform. Your audience needs to get to hear you, read your work, and get to know you. Once they know you, they are in a better position to buy your book when it’s published. Also, publishers choose to publish writers who are in touch with their target audience through their platform. Read more about platforms here. If you identified your family or a civic group as your WHO and perhaps the goal to raise money or to share recipes with your college-age children as your WHY, your cookbook concept is pretty straight-forward. Your book will contain a set of recipes and maybe some stories, genealogy, history, or photos. For this type of cookbook, there are online tools and other software to compile your recipes. Costs for each service varies, but because the software streamlines the process it may be worth the price. Outside of online tools, word processing software, such as Microsoft Word or Google Docs, works well to create your book’s interior pages. For a more upscale design consider software such as Adobe Design. If you want to use an online tool or software to compile recipes for family, your next step is to choose the software or online tool that best suits your needs. Refer to this summary of 5 Tools and Software for Writing a Family or Fundraiser Cookbook. 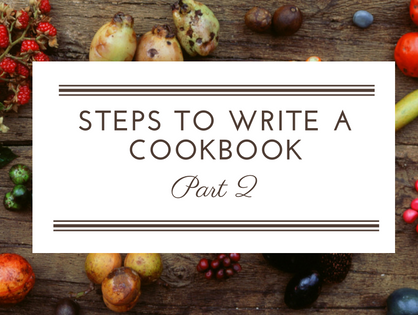 This is part #2 of a series of blog posts to help aspiring cookbook authors walk through the steps to writing a cookbook. In part #1 we discussed the importance of identifying WHO you are writing your book for and WHY you want to write a cookbook. Your WHO and your WHY are unique to you. Every aspiring cookbook author has a different audience and set of goal for their project so it’s important not to skip part #1. NOTE: If you identified your family or a fundraiser cookbook as your WHO and WHY, it may not be necessary to define your concept in a lot more detail. You know that you plan to write a cookbook to share a set of family or curated/collected recipes. You may decide to add stories, genealogy, history, or photos to the recipes, but your reason to write your cookbook is clear. The next steps for a family or fundraiser cookbook involve the process to collect recipes, organize them into chapters, write a table of contents, and make decisions about how to compile the manuscript, design the book’s interior, and print the manuscript. Refer to this blog post for 5 Tools and Software for Writing a Family or Fundraiser Cookbook. Outside of family or fundraiser cookbooks, if you identified your clients, customers, or other cooks and/or bakers as your audience, then the concept for your book needs to be defined in more detail. Whether you write articles, newsletters, books, or blog posts, it takes discipline to sit down and write. There are so many other things I know I could be doing right now rather than writing this newsletter. The sun shines. The air is cool. My flowers need a drink of water. I’m hungry. I’m tired of sitting. I need some tea. My kitchen floor needs to be swept. And what about that good idea I had for a new project, maybe I will do some research? 1. If you’re like me, you have a lot going on and perhaps many writing tasks that need to be done on different parts of your work. Here are 5 Steps You Can Take Today to Organize Your Writing Life. 2. If you ever think of self-publishing your book (meaning you wear every hat in the publishing process) you’ll enjoy this review of 5 Must Read Blogs for Self-Publishing Authors. 3. It’s not unusual to hear writers complain about writing. Complain about agents. Complain about publishing. This article takes a look at positives of being a published writer from the perspective of Amber Lee Easton, from Mountain Moxie Publishing and Creative Services. 4. This article is over a year old, but stirred up a great debate recently in a Facebook group I belong to. If you write recipes, you might enjoy this article (from the UK) about recipes using volume VS weight. 1. Achieving a goal such as writing a cookbook isn’t always about talent, physical looks, TV shows, or hundreds of thousands of social media followers. More than these what can help someone achieve a big goal are the habits they practice on a daily basis. Here’s an article I enjoyed about 8 Habits More Important to Success Than Raw Talent. 2. When writing a cookbook we need to define the audience for our book and recipes. Is the audience kids, retirees, or teens? Maybe it’s young moms, single parents, or the DIY crowd. This recent Bon Appetit article brings to light the Millennial generation (born early 1980’s to early 2000’s) and their focus on food. Maybe they are the audience for your cookbook? 3. Is food writing becoming a “men’s club”? Kathleen Purvis explores this topic in her recent article and study of the pre-dominance of male voices in 21st century Southern food writing. 4. Santa Monica’s Huckleberry Bakery owner Zoe Nathan wrote a cookbook that was published in 2014. I love this article about her experience writing a cookbook. When she wrote her cookbook she enlisted the help of recipe testers mainly because she had to scale the recipes to home-size quantities. Her honesty about “winging it” while writing a cookbook provides a lesson in willingness to just do the work even if you don’t always know exactly what you’re doing. I also like her discussion about life balance while writing her cookbook, raising a family, and operating the bakery. The truth is that more often than not cookbook authors lead busy lives in a kitchen and find time to write their books in spite of other things going on in their lives. 5. Cookbook publisher Phaidon plans to release three vegetarian cookbooks this spring. This interview with Emilia Terragni at Phaidon reveals why they are publishing vegetarian cookbooks. 6. And for fun, here’s the Epicurious’ Spring Cookbook roundup for 2016. 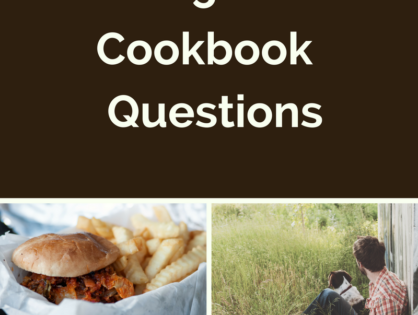 Q&A: How Do I Write a Cookbook Proposal that Attracts Agents and Publishers?